Burrills View in Horderley, near Craven Arms, Shropshire sleeps 6 people. Burrills View near Craven Arms is a detached stone cottage which sits in an Area of Outstanding Natural Beauty, only 5 miles from the foot of the Long Mynd on the Shropshire border, close to the Welsh Marches. The Onny Trail is on the doorstep leading to walks on Wart Hill, Hopesay Hill on the Shropshire Way and the Jack Mytton Way which goes up over the long Mynd. It has an enviable position close to the road networks, yet has fields and woodland to the rear. The field across the road belongs to the owners, and has the River Onny running along the bottom where you can relax and try your hand at some wild fishing. 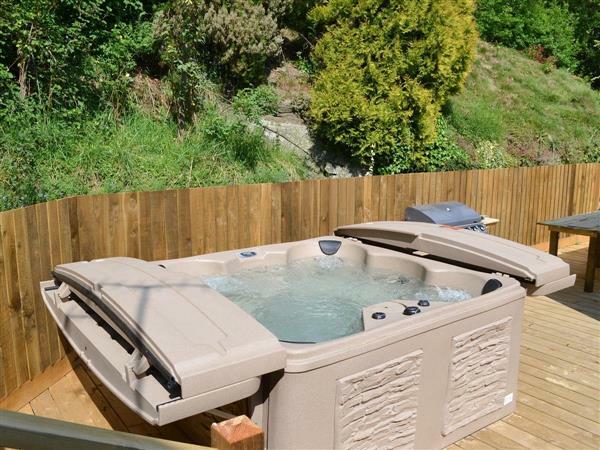 The cottage has its own private patio area with sole use of a six-seater hot tub. Shropshire is a great area to visit with plenty of activities and places to visit within a short distance. Some of the attractions include Acton Scott Working Farm, Secret Hills Discovery Centre, Stokesay Castle, and the vibrant market town of Ludlow with it castle, racecourse, weekly markets, and numerous food fairs held throughout the year. The Glider Centre on the Long Mynd and Carding Mill Valley (National Trust) is a must for adrenaline lovers. The beautiful market town of Ludlow, well known for its food festival and Historic Shrewsbury is set on the banks of the River Severn and offers a great selection of shops, bars and restaurants. While in nearby Condover there is an activity centre where family activities include low ropes, high ropes, kayaking and laser tag. The Edge Adventure Activity Centre at Much Wenlock offers quad bike trekking, clay shooting, mountain boarding and much more. For the more relaxed approach to your holiday there are some lovely towns and areas to visit such as Bridgnorth with the Severn Valley Railway, inland funicular railway and the historic Ironbridge gorge and museums. From the property within an hour’s drive there are Powys Castle, Berrington Hall and Attingham Park all National Trust properties and just a little further you will find Chirk Castle, Erddig and Croft Castle. The shop is 1½ miles from Burrills View near Craven Arms, with the pub 1 mile and restaurant 3 miles from Burrills View. Burrills View near Craven Arms is all on the ground floor. Boot room: With storage for boots and coats. Living room: With wood burner, Sky TV and DVD player. Kitchen/dining room: With wood burner, electric oven, electric hob, microwave, fridge/freezer, dishwasher and washing machine. Bedroom 1: With double bed and en-suite wet room with double shower cubicle and toilet. Biomass central heating, electricity, bed linen, towels, Wi-Fi and logs for wood burners included. Travel cot, highchair and stairgate available on request. 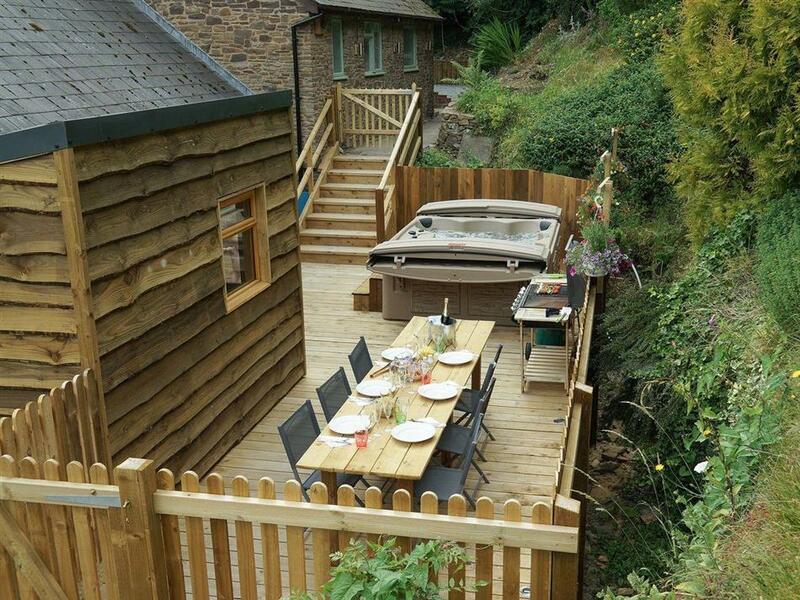 Enclosed decked area with garden furniture and barbecue. 5-acre natural grounds and woodland (shared) with ¼-acre field with river frontage (private). Hot tub for 6 (private). Bike store. Private parking for 2 cars; additional parking available. No smoking. Holidays at Burrills View run from Friday to Friday. Pets allowed at Burrills View. For a better idea of where Burrills View is, you can see Burrills View on the map below. Burrills View is in Shropshire; should you be on the lookout for a special offer, you can find all the special offers in Shropshire. It's always worth checking to see what is on offer at the moment. Do you want to holiday near Burrills View (UKC2009), you can see other cottages within 25 miles of Burrills View; have a look to find your perfect holiday location.